Mo Willems, a number one New York Times best-selling author and illustrator, has been awarded a Caldecott Honor on three occasions (for Don't Let the Pigeon Drive the Bus!, Knuffle Bunny: A Cautionary Tale, and Knuffle Bunny Too: A Case of Mistaken Identity). Don't Let the Pigeon Drive the Bus! was also an inaugural inductee into the Indies Choice Picture Book Hall of Fame. The celebrated Elephant & Piggie early-reader series has been awarded the Theodor Seuss Geisel Medal on two occasions (for There Is a Bird on Your Head! and Are You Ready to Play Outside?) as well as garnering four Honors (for We Are in a Book!, I Broke My Trunk!, Let's Go for a Drive! and A Big Guy Took My Ball!). Tony DiTerlizzi, a number-one New York Times best-selling author and illustrator, created the middle-grade series The Spiderwick Chronicles with Holly Black, which has sold millions of copies, been translated into more than 30 languages and made into a feature film. He won a Caldecott Honor for illustrating The Spider & The Fly, and in 2014 he teamed up with Lucasfilm to retell the original Star Wars trilogy in a picture book featuring artwork by Academy award-winning concept artist, Ralph McQuarrie. He lives in Amherst, Massachusetts with his wife, daughter and dog, Mimi. The Story of Diva and Flea by Mo Willems is a wonderfully cute and unforgettable tale of discovery. 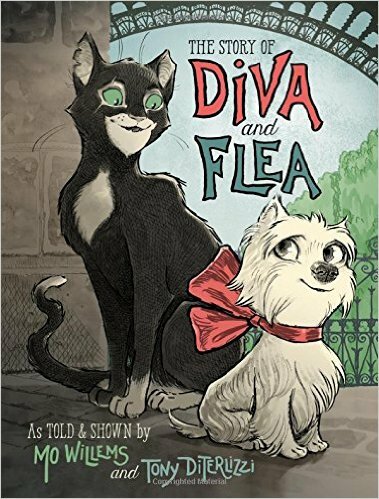 Diva the dog, a flee the streetwise cat form an unlikely friendship forms. My daughter absolutely loves this book. I love that it's a chapter book and is a great way to introduce children to chapter books because they chapters are fairly short and fun to read. The illustrations throughout the book are adorable and go right along with the story. This is a terrific book and would make a perfect gift for children ready to begin reading chapter books! by Mo Willems on Amazon, Barnes and Noble and other bookstores.